RTalloni believes that real gardening is the best exercise there is. 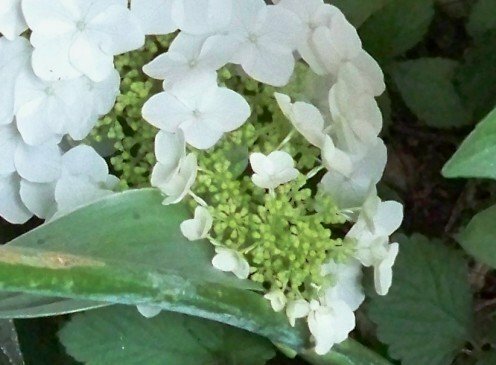 Blooming hydrangeas have been known to cause people to break into poetry. Discovering the oakleaf hydrangea in bloom has been known to leave them speechless for at least a few minutes. 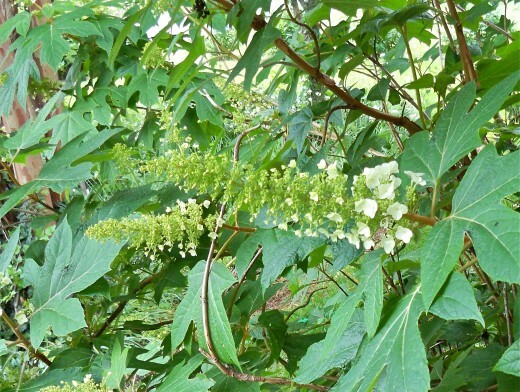 Most are full of questions about this native, old-fashioned shrub. Enjoy these bloom photos of the oakleaf from my garden and let us know in the comments below what you think of this lovely plant. Reading various articles on photography encouraged me to make use of my cameras in my own garden. One particular afternoon’s weather and light afforded a perfect opportunity to apply some of the techniques I had been reading about. 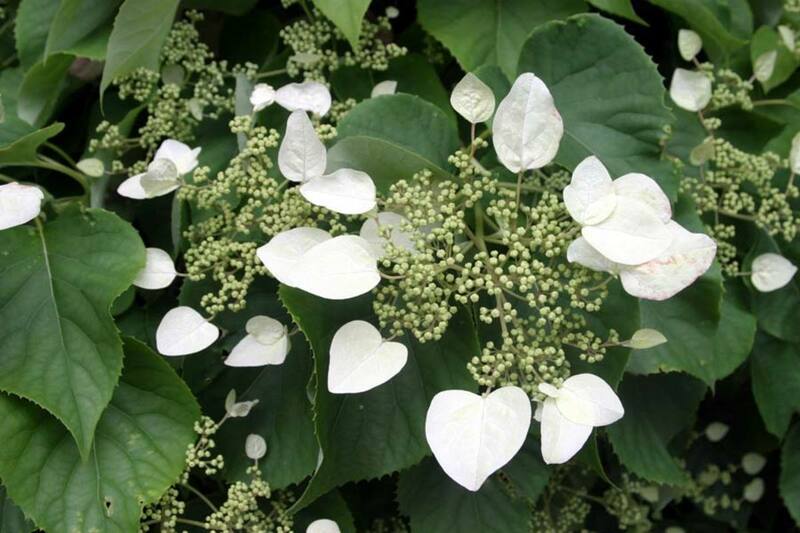 The oakleaf hydrangea is native to the United States, making it the only true American hydrangea. The flowers are stark white, generally turning to a pale pink in early summer which seems to make spring last just a little longer. 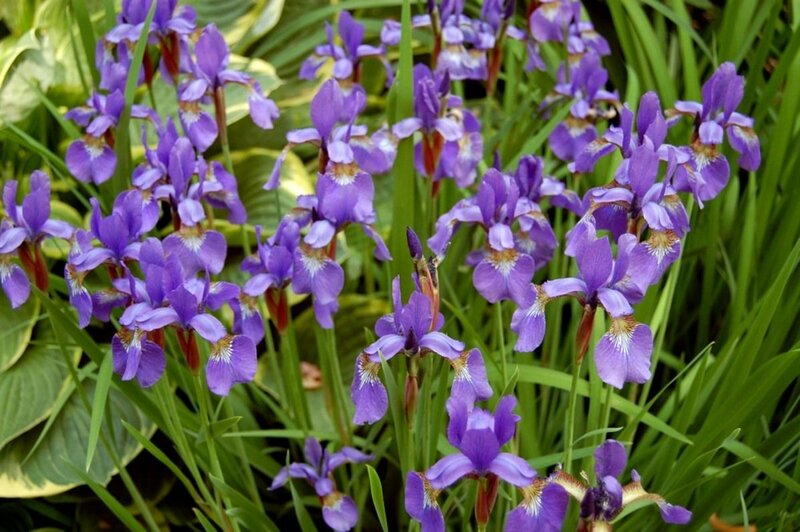 The blooms can last well into the summer unless they get too hot and dry. Heat we can't control, but when watering it's important to make sure not to overwater for damp roots make the plants unhappy. In trying to get a good shot that would show the 12' x 8' size of this hydrangea I think I was able to capture the feel of it in the lens. The photograph above is from the top level of my front porch. Hoping to get a comparison of the plant's leaves next to the dogwood on the left, catching the sun playing in the clouds just right was a bit of a trick. This plant is truly larger than life, just like our American landscape! To me, the oak leaf’s individual flowers are very similar to the dogwood’s blooms, albeit a miniature version. Their profuse blooms literally light up the shadows they grow in. 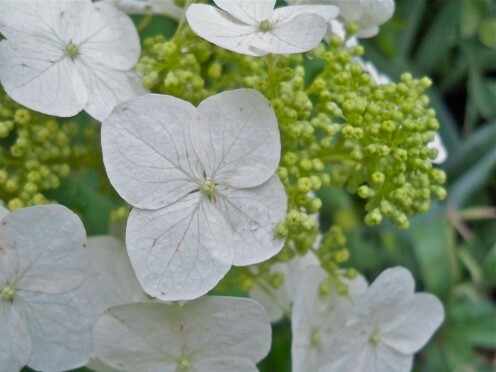 This hydrangea species is an old-fashioned type meaning it can withstand almost any condition except wet feet. 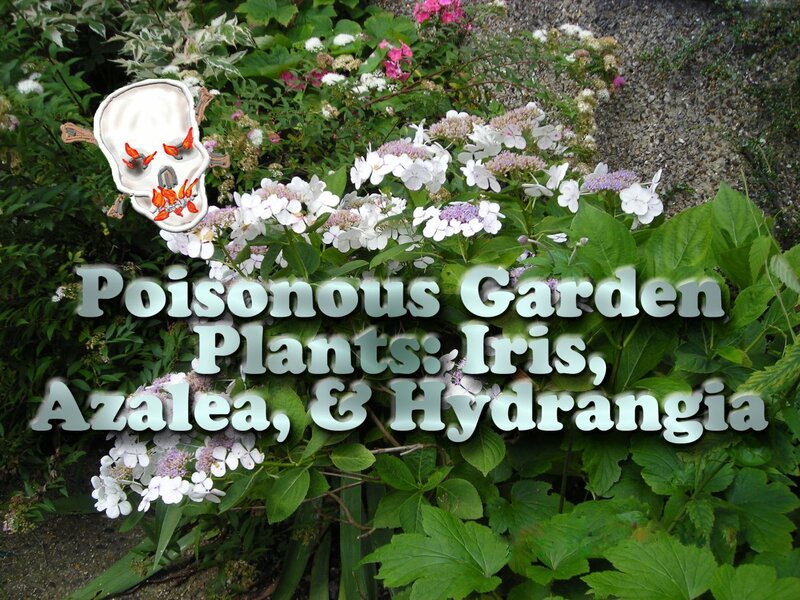 If it sits in damp soil for even a short time, it will likely die. The upside is that it can take some drought, tolerates a bit of direct sun, and does very well in deep shade. It doesn’t always lose all of its leaves in the winter, even when we have a lot of snow. Its nice large leaves provide cool shade for man and beast alike in the heat of summer. It likes to be left alone to grow into it's magnificence, but tolerates pruning well when needed. Having at least one oakleaf hydrangea you can let go in a back corner is a luxury everyone should enjoy. 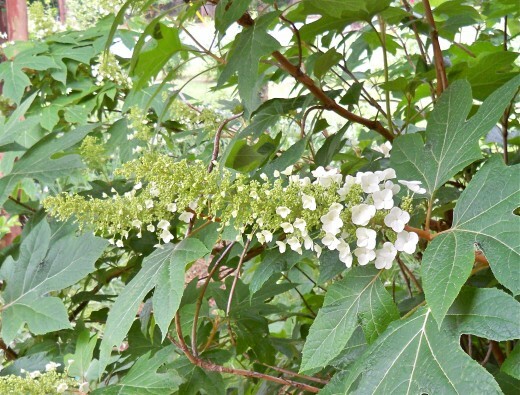 The cone shape of the oakleaf hydrangea’s bloom is like a grape cluster, and the foliage turns a rich grape color. My friends laugh when I call the plant a "grape leaf hydrangea." Not only is my 8-year-old hydrangea large, but mature leaves are also rather titanic compared to most. They remind me of a giant fig leaf, but whoever named the species obviously thought of an oak leaf when they saw it. I think the fig leaf image in my mind also comes from the way the plant’s leaves are arranged on the stems. If I'm really stumbling around to describe I'm likely to call it a grape-leaf hydrangea because of the shapes and colors this plant dances with throughout the seasons. There are now a couple of varieties of oakleaf hydrangea, but I cherish this quaint friend for it makes me think of people from years gone by who enjoyed this good-natured plant. Brush out a clean spot of dirt under the plant. Set a large rock on one of the prolific lower limbs. Wait. In a season or two (definitely by the next year) a new plant will have taken root. Pot it, or give it to a neighbor so your neighborhood can enjoy more of them. I sure wish I could share a cutting off mine with you! 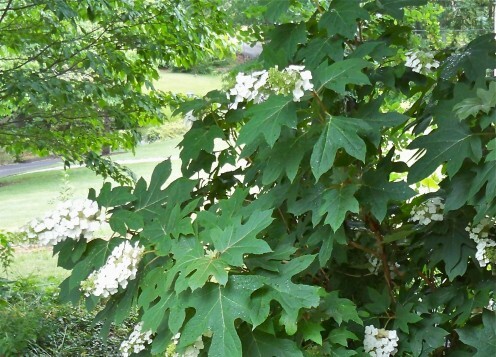 Are Oakleaf hydrangea deer proof? No, deer do enjoy Oakleaf hydrangea. 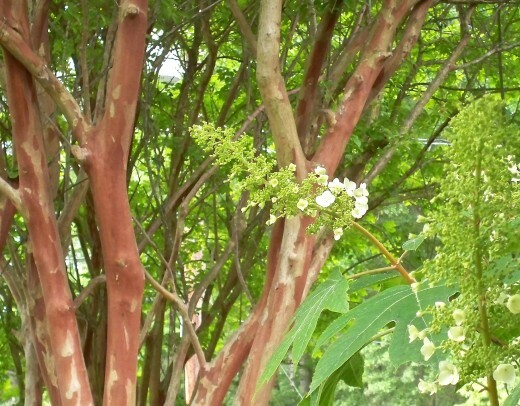 You might like to check out this useful post on protecting plants from deer damage: https://savvygardening.com/deer-proof-gardens/. If my Oakleaf hydrangea is in the shade and not growing or blooming into the second year, what is your advice? Though they do well in shadier sites, some sun may be your need. It may be that you need to water roots regularly about three times a week, keeping water off leaves especially during hot evenings. I imagine that if the ground around the plant were too wet, it would have died by now, as they need to be well drained. Can I cut back the blooms of my Oakleaf Hydrangea since they fade and tend to dry up? If I prune the blooms, will they start another blooming cycle? I do not think they rebloom in one season, at least not in my experience. However, I do find that the blooms last a long time if the plant does not get too dry or too much sun. 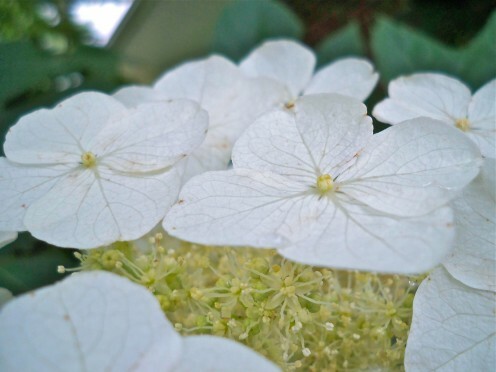 Are You Familiar With the Oakleaf Hydrangea? 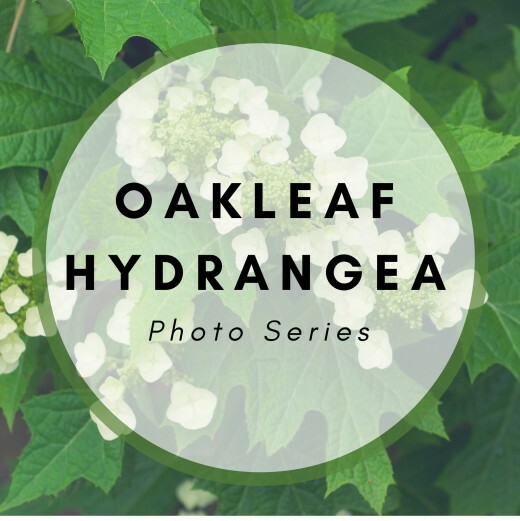 Beautiful photographs accompany your information about this Oak Leaf Hydrangea. Sometimes you write poetically, something that really works well with describing the beauties of nature. How wonderful to find a lovely plant like that! I would enjoy seeing a photo but the surest way to identify your plant would be to take a picture with a leaf to a local nursery or extension office in your area. It sounds like you are already enjoying its flowers. Happy summer to you in your new house! I found a lovely bush behind my new home with small white flowers growing in clumps(like lilacs). I have a picture of Facebook and asked my friends to help me identify it. 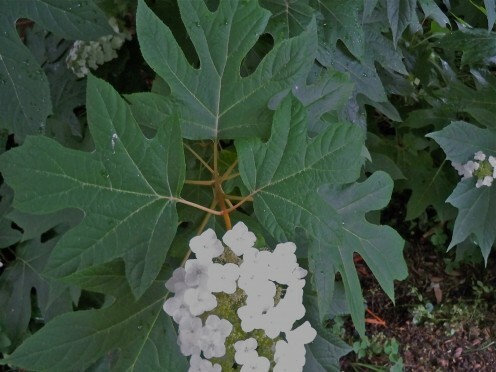 One person suggested it may be an Oak leaf hydrangea. 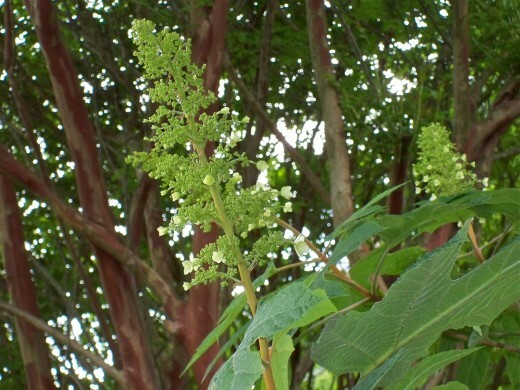 The leaves look similar, but the flowers do not. Can I attach a picture for you? You are welcome, and thank you for checking out this hub and letting us hear from you. 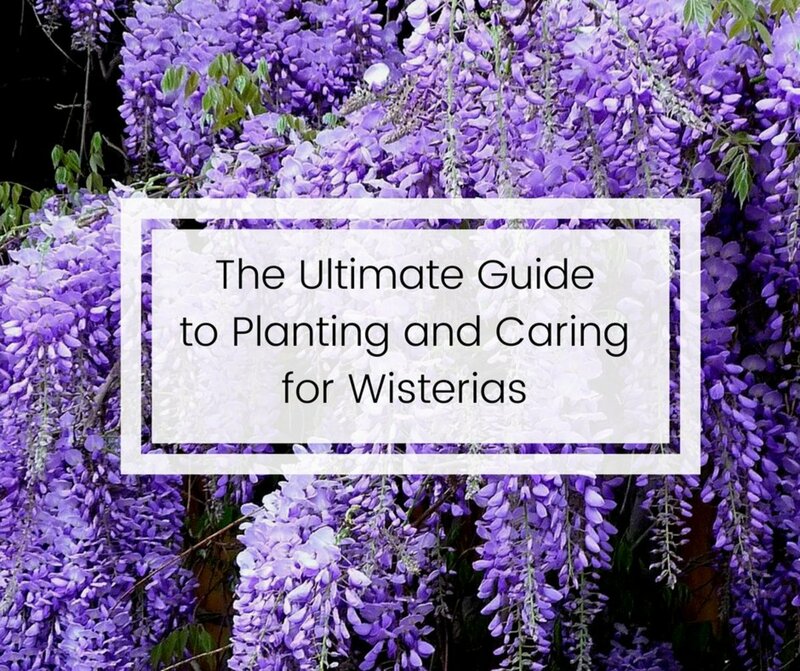 It sounds like you will enjoy some lovely blooms this year. Enjoy! I have acquired one last year and am anxiously awaiting it to bloom. It is in the shade. The one I planted in the sun died Thanks for the pictures. Didn’t know what to expect. So glad to be able to introduce you to this amazing hydrangea. Wish I could share one of these with you! I'm taking some progressive photos of a few of this spring's blooms from one of my front windows and will be adding a new photo montage to this hub soon. Actually, I may go ahead and set it up, then add a few pictures as they bloom out. Thanks very much for the visit and for letting me hear from you! 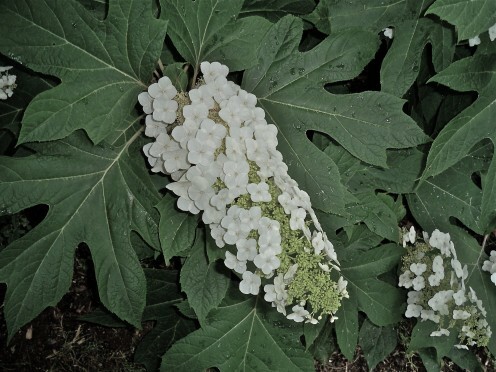 I have never heard of an oak leaf hydrangea, probably because they are native to the US, though it surprises me that it hasn't been introduced here (Aust) as it sounds to be very hardy, tolerating conditions that traditional hydrangea would turn its toes up at!! The flowers are lovely. Thank you for this interesting hub. My votes and sharing! This looks like a great shrub I would like to try. I love hydrangeas, but have not had much luck with them. I may have to try this one. Great information, voted up and interesting. Thank you for SHARING! Have a wonderful day! Thanks kindly! I appreciate your comments and your follow--glad you enjoyed this hub. Unique content with unique photos of plants. I like it. I am following you RH. Vote up! So appreciate your visit and comments! Appreciate your visit to this hub! Never heard of an oak leaf hydrangea but it looks wonderful. Like the flower shape. I'll be looking out for this one in the catalogues. Their blooms are amazing, shade or sun. 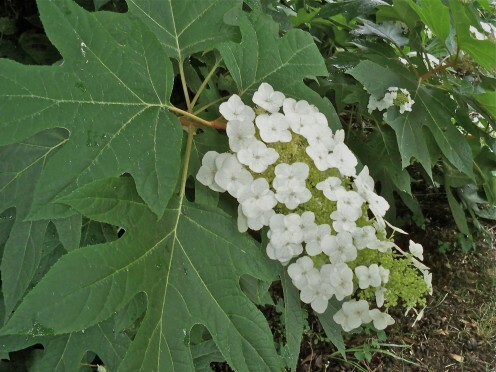 I saw an oak leaf hydrangea last year, out in the sun, blooming beautifully and was surprised, thinking that oak leaf hydrangeas need shade or partial shade. Thanks for clearing that up. Voted up! I can hardly believe how big some of the oak leaf hydrangea's blooms get. One is almost 2' long. Ah Hydrangeas, one of my absolute favorites! Not just because of the vibrant colors and varieties but because I have fun drying them and then making pretty wreaths or dried arrangements! They are so easy to work with even dried. Great hub R. on one beautiful plant! Thanks! I bet your garden is beautiful!!!! So glad you enjoyed the hub and found the info helpful. 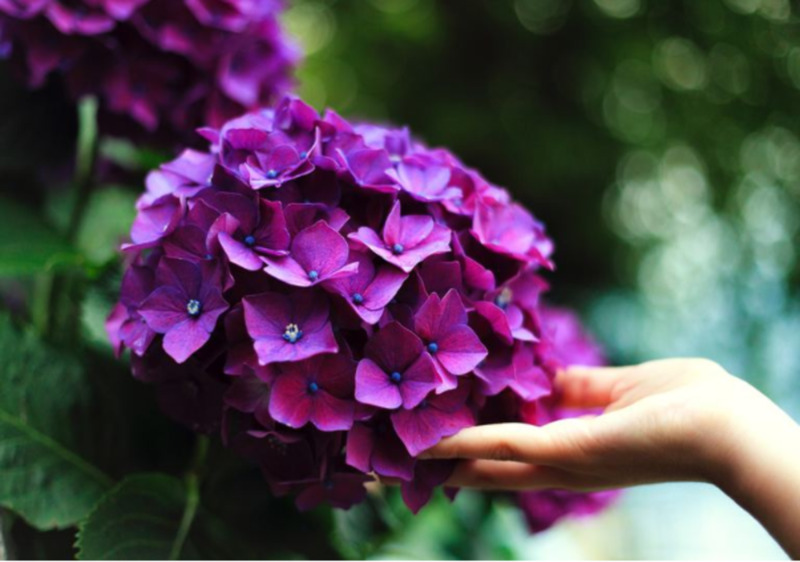 You won't be sorry for adding hydrangea to your home's landscape. It is a very peaceful plant. Thanks bunches for visiting and commenting! Not a euphemism at all, but thanks for telling me it could be so I can be prepared if need be. If it's not a good thing I'm glad the HPPD would be on it quick. Thanks much for coming by and leaving a note. So glad it was interesting to you! So glad you enjoyed the hub, but mostly glad that you enjoy the beauty of hydrangeas! Our son and family recently visited New Zealand and enjoyed it very much. Thank you for stopping in with your comment! I love the flowers! I looked up the meaning of the different flowers. I found some that I wanted to plant outside my home. I think it will add not just color to the outside, but a continuity that is inside our home. When we have visitors, I feel it is good to have a peaceful experience as you walk in, and then it continue when you see the conformity of the inside. I am all about keeping oneself completely centered. Awesome hub! Voted up! Is Pinky Winky a euphemism? If so, the HP police will be banging on your door. I'm going to look for the St John's Wort. If I can't find it, could you put to URL here? Please!!! These hydrangeas are lovely. We don't have the oak leaf variety here in New Zealand as far as I'm aware, but they certainly are beautiful. Thank you kindly for stopping in and sharing your input. So glad you enjoyed the hub! I posted the second one--St. John's Wort--this evening. Appreciate your interest very much! Thank you...so glad you enjoyed the pics. Appreciate your input! Appreciate your coming by with your comment! Thanks much for your visit as well as for your generous and kind comments. That's great! :) Plants from special people are a treasure for many reasons! I should have mentioned that mine was just such a started plant about 8 years ago. I've pruned it for the last 5 years because it is right on the house, but I really want to find a spot to put one that I can "let go." TDF: Thanks kindly, both for stopping in and commenting. Isn't it amazing how unique the hydrangea is and yet how many varieties there are? You are welcome, sofs. It's such a nice plant for the garden, waving at passersby with the slightest wind, holding out arms of shade to any in need of it. When my kitty is not taking advantage of its shade, the birds certainly do! Beautiful shots and flowers. I have a lot of sandy soil and lots of heat/sun. Are they a hardy plant???? Thanks Pamela. I'm not sure if your area is too hot for them but they do like sandy soil. What a lovely hub. We don't have that one in the UK... perhaps the wetness wouldn't help. I know nothing about plants and gardens (you should see my jungle! 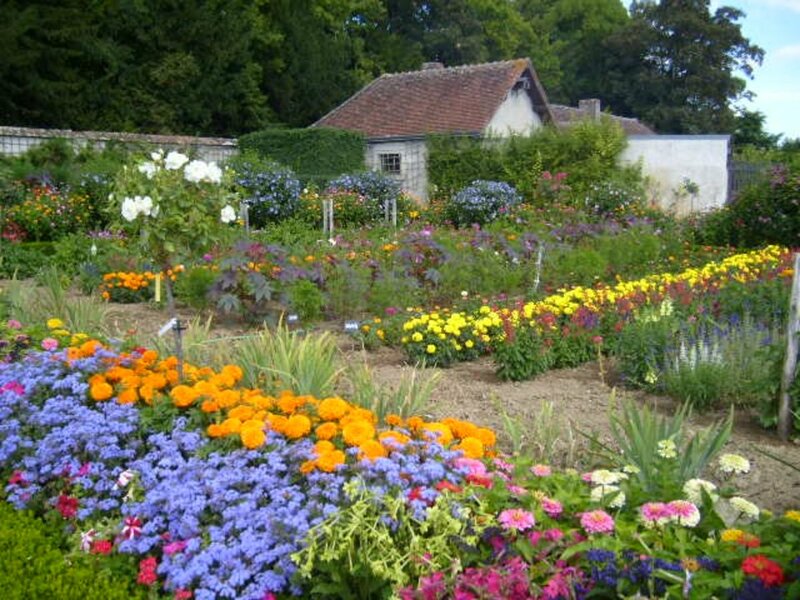 ), but your hub makes me realise that you know and love; and are not one little bit boring about your garden. Lobed it so I am marking up useful, beautiful and up... How's that? I have one of these! 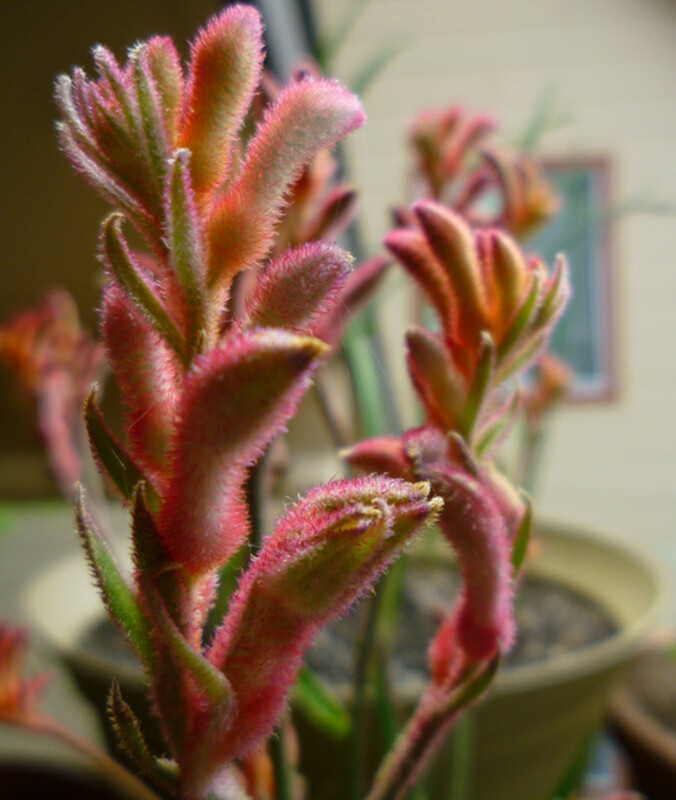 If was given to us by my mother in law, and this year it is getting it's first blooms. I am so excited about how much it has grown this spring, as it was just a tiny starter when we got it. Your photos are gorgeous, great job! Voted up. Wow I have never seen or heard of this shrub before. Informative and useful hub :) Thanks for sharing!! I was not familiar with the Oakleaf hydrangea but is absolutely beautiful. I have always liked hydrangea bushes anyway. Rated beautiful. Aren't they just beautiful!! I have several in my yard too.